Arizona’s bioscience sector is adding jobs at a rate outpacing the biosciences nationally and the state’s overall private sector, while Arizona’s public universities are seeing increases in bioscience research funding, expenditures and tech transfer, a new report shows. Bioscience jobs grew by 58 percent in Arizona between 2002 and 2016. And in the post-recession years since 2009, Arizona’s total bioscience jobs have increased by 22 percent (29 percent for non-hospital jobs) compared with 14 percent in the private sector. Nationally since 2009, total biosciences jobs have grown by 8 percent. There are 25,686 non-hospital bioscience jobs in Arizona and 116,443 total bioscience jobs, an increase of about 6,000 total jobs from 2014. Since 2002, Arizona bioscience jobs have increased by 58 percent. Venture capital funding in 2017 for bioscience firms was $40 million for the second year in a row, a decline from the $82 million recorded in 2015. It also represents just .22 percent of U.S. bio venture capital. University bioscience tech transfer is showing steady gains, with 33 bioscience startups, 119 patents issues and 131 licenses issued in 2016 and 2017, a 57 percent increase in spinouts over the previous two-year span. 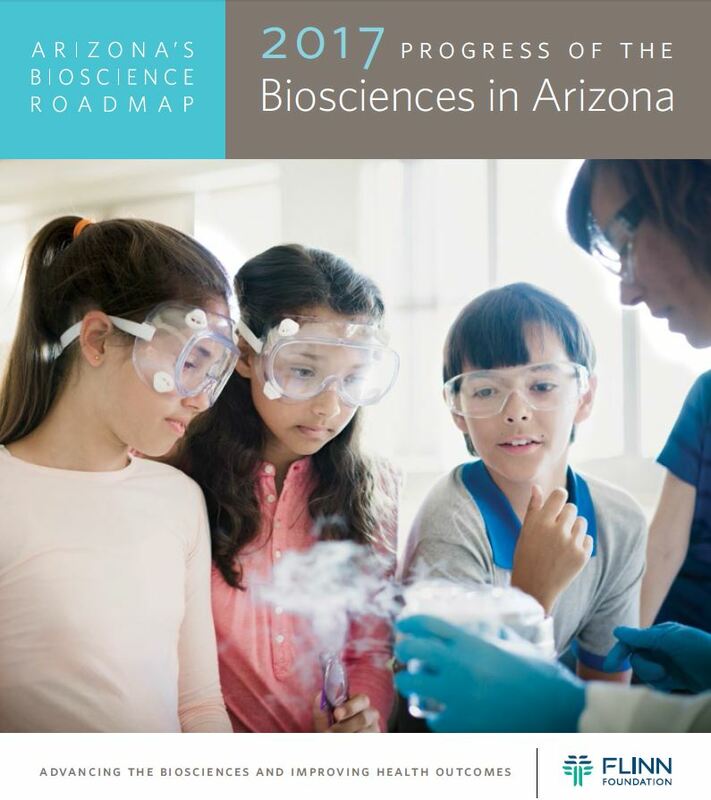 “As we move beyond the 15-year mark since the launch of Arizona’s Bioscience Roadmap, our state continues to see the rewards of this strategic plan, built on collaborations and partnerships throughout Arizona. It should offer confidence to policymakers that state investments in the biosciences will be catalysts for both improved health outcomes and economic growth,” said Tammy McLeod, president and CEO of the Flinn Foundation. View the Roadmap Progress Report brochure and the slides.